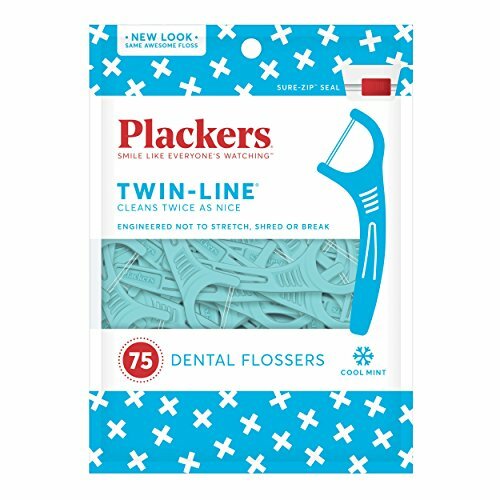 Clean your teeth twice as nice with Plackers Twin-Line Dental Floss picks. Made with Super Tuffloss and engineered not to stretch, shred, or break; these floss picks have two lines of floss to effectively and comfortably remove plaque and dislodge bits of ick like food particles all while working to whiten your teeth and create healthier gums. These flossers also have a cool mint flavor and advanced whitening formula to keep your smile fresh and bright. Plus, there's a fold-away pick built into the handle that's perfect for getting at hard-to-reach places or particularly stubborn bits of food. With Plackers Twin-Line Dental Floss Picks you can be confident that your teeth are looking their best and you can smile like everyone's watching. Since pioneering the first dental flosser, patented over 40 years ago, Plackers has helped brighten the smiles of millions with our complete suite of dental solutions: We know your smile is important to you, so let us help you keep it clean and healthy!